Welcome to the Dog Leads & Leashes superstore! We've got every conceivable type of lead and leash for your best friend. Take a look and find the right one for your pooch! Some dogs just are tough to keep in check. A simple, casual walk can turn into a battle between your arms and your dog's curiosity at just the faintest whiff of a squirrel's scent. When this happens, you need something tough enough to match your dog's willpower to keep him in check. 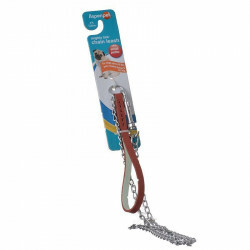 A durable, steel chain lead leash provides dog owners with the resilient, tough leash they need to remind willful dogs who is in charge. 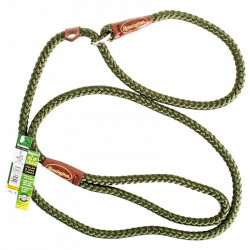 Heavy duty chain lead leashes are comfortable and safe for your dog and very useful in training. Leather dog leads provide all of the strength, flexibility and durability of leather for optimal training effectiveness and security for your dog. 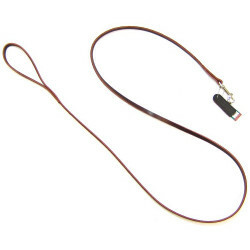 Leather lead leashes are made to resist even the strongest dog's efforts to break free, while still allowing him comfort and the freedom to move. Made from tough hide, each leather lead features a heavy duty loop handle for an easy, convenient grip that is perfectly adaptable to your hand, arm, or bike. 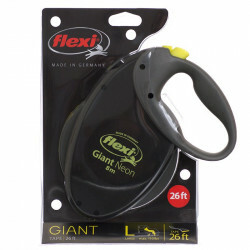 Now you can walk your dog with confidence that he is completely safe and comfortable. You step outside with your dog for the evening walk, and immediately a new smell reaches his nose. Off he bolts, eager to search and explore until he finds the source of this curious new scent. If not for the trusty lead leash you have attached to his collar, he might race straight across the neighborhood, cause damage to your or your neighbors' plants and gardens, or worse, end up in the middle of the street. Leashes are an incredibly important part of owning a dog, and the right leash can save you and your pet from a world of trouble every single day. Retractable dog leashes have revolutionized the fine art of dog walking! Instead of the rigid, fixed-length leads that used to be the only option, retractable leads allow your dog greater freedom when on a walk or at the park, while still allowing you to keep a tight rein on his safety. Retractable leads are extremely portable and easy to store, making them the perfect leash for travel. By letting you walk at your own pace and letting your dog walk at his, the retractable lead leash lets you get back to enjoying your walk!